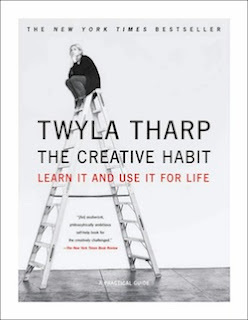 I just finished reading Twyla Tharp's The Creative Habit: Learn It and Use It for Life. I loved this book and will likely have more to say about it at another time, but for now I want to say that one of the aspects of the book I enjoyed was that so much of what Tharp says about her life and work as a dancer has parallels to the life and work of a poet. For example, some of her strategies for getting herself out of a creative slump could easily work for poets. 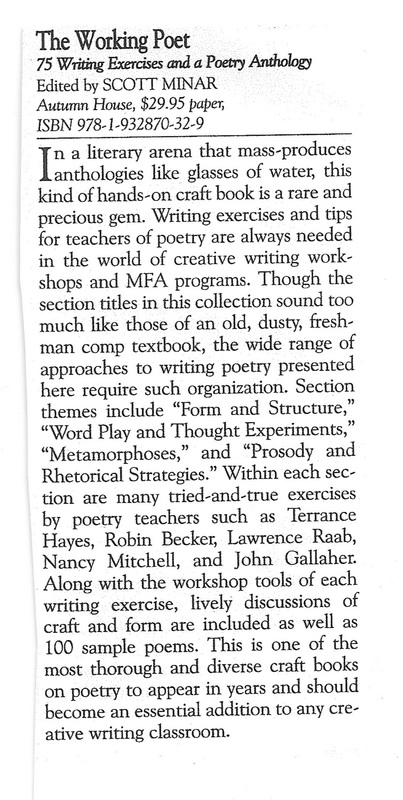 One activity Tharp uses to get out of a creative dead end is called "Do a Verb." She chooses a verb and acts it out physically. For example, the verb squirm leads to wiggling her hips, shrugging her shoulders, and moving her limbs in such a way that a "dance phrase" gets underway. She videotapes the process and when she plays back the video, she invariably finds something "strange and new" that revs up her dance engine. I think that we poets could translate this exercise to poetry. Choose a verb and free write about it for five minutes. See what emerges. 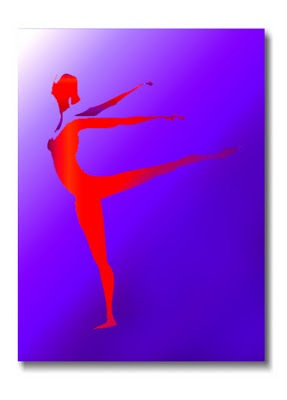 Or begin literally with the physical, as a dancer would. Then write about that. Some verbs suggested by Tharp: dart, twirl, chafe. Then there is her "Civilian Big Ten," verbs consistently suggested by groups she's worked with: push, spin, run, jump, twist, roll, skip, turn, walk, fall. But feel free to choose your own verb, a snazzy one or an ordinary one. This activity might be a good way to end 2010 or to begin 2011. Or both. 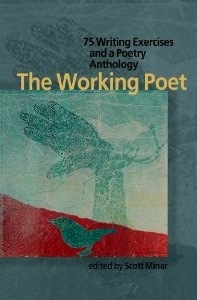 Last year I reviewed The Working Poet, edited by Scott Minar and published by Autumn House Press. I love this book. It's loaded with wonderful prompts for new poems. I have two exercises in the book, each with a sample poem. I'm joined by a few dozen other poets whose prompts and poems have stimulated some new poems for me. I'm sure the book would do the same for you. I was delighted to see this brief review in the current issue of The Bloomsbury Review. I agree completely with the recommendation made in the last sentence. But you don't have to be in a classroom to use the book. You can use it to home school yourself. If you don't yet own this, now is the time to treat yourself. I was recently interviewed by Derek Alger for Pif Magazine. The interview appears in the December issue. Derek works in a somewhat unusual manner. In the past the interviewer has sent me questions via email, sometimes a few at a time but usually all at once. I then responded to the questions and sent them back. But Derek wanted to talk first on the telephone. We made a phone date and then chatted for over an hour. A week later Derek emailed his topics, not really questions, with some notes on what I'd said on the phone. He told me to respond any way I wanted. So I incorporated some of his / my notes and took off from there. Some of the topics covered are the public response to my new book, my experience at a recent reading and makes for a good reading, my late bloomer status, graduate school, my David Copperfield childhood, teaching, my first two books, time spent at The Frost Place, my current work in poetry. I am grateful to Derek for doing the interview. You can read the interview here. I didn't expect to get any more reviews of my second book, What Feeds Us, so it was just delightful to learn that Sheila Bender had reviewed the book in her magazine, Writing It Real. This is a subscription only online publication, but occasionally there's an issue that includes non-subscribers. The review appears in one of those issues. Sheila gives a generous overview of the collection, then zeroes in on three poems: "Love Test: A Ghazal," "Blueberry," and "Idiosyncrasies of the Body." Since Writing It Real is a newsletter that goes to writers, the review is followed by three prompts, one based on each of the three poems. There's also a blog where people can leave comments. "A 2006 Quentin R. Howard Poetry Prize winner, the volume is as witty as it is heartbreaking. Diane's poems draw her readers in as they transform visits to the hair dresser, eating pickles as a child, wanting more out of a marriage as a husband brings in cold pizza on a snowy night, being stung by a bee and tended to lovingly, looking at blueberries in her kitchen, noticing an announcement about a coming test, or having an MRI and dreading the results into moments of revelation and introspection. Diane's gift for melding observations of food she prepares, activities in her life, and notions of her own and others with her deepest longings and fears reaches fully into the heart." You can read the entire review here. I love this review! You might be interested in subscribing to Writing It Real. It costs $30 per year. 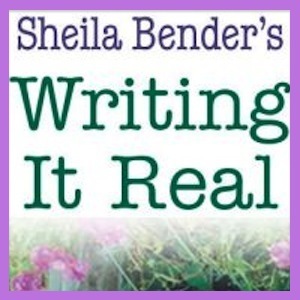 Sheila is an experienced poet, prose writer, editor, and teacher. Read some Free sample articles. Consider treating some writer you know to a subscription. Consider treating yourself to a subscription. If you're in the Philadelphia area, please join us. It sounds like fun. On Saturday, December 11, 2010, the Mad Poets Society will present a special music and poetry reading, “A Little Winter Madness: A Sampling of Mad Poets,” featuring four poets and three musicians. 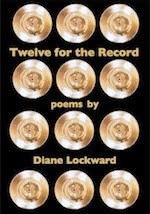 The four featured poets are Thaddeus Rutkowski, Diane Lockward, Gloria Parker and Jason Fritz. The featured musicians are renowned local singer-songwriter, Tom Mullian, and the talented duo, “Silver Wind,” comprised of Mike Mascia on American Indian flute and Jackie Neuman on guitar. I went to the mall this morning and tried to get into a holiday spirit. It didn't work. The Short Hills Mall is beautiful and there's covered parking which is great on a cold day with bits of white stuff coming out of the sky. But the Santa display was all blocked off with huge plexiglass cases. 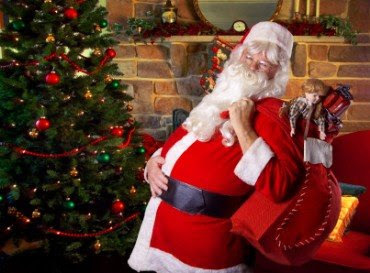 I couldn't see the little kids with Santa or any of the Christmas display. Bah humbug. Then Macy's—ugh, what a nightmare! Get me outta there, fast! Is there some reason why Macy's has to have the heat up so high and the perfume in the air so thick? Okay, I got that out of my system. Now onto far cooler stuff. This weekend poet and blogger Kristin Berkey-Abbott added this post to her blog: "Favorite Poetry Books of 2010: Add These Books to Your Shopping List." I like the imperative that comes after her title's colon. I also like having my own Temptation by Water on that list! My book is keeping good company on this list. Several of the books I already own and can add my recommendation to Kristin's: Letters from the Emily Dickinson Room, by Kelli Russell Agodon; I Am the Jukebox, by Sandra Beasley; Unmentionables, by Beth Ann Fennelly; Underlife, by January O'Neil; and The Alchemist's Kitchen, by Susan Rich. Kristin's list sent me over to Amazon where I ordered Poetry in Person, edited by Alexander Neubauer. I've added a few of the other titles to my next order list. The list put a smile on my face and so did reading these words in Kristin's post: "And as I chose this list, I couldn't help but notice how every book but the one by Kamiko Hahn came to my attention because of blogs. With several books, I already knew about the poet (again, usually because of stumbling across their blog), and I had the pleasure of watching the book publishing process of the book on the list below (author photos, blurbs, promotional videos, book covers—a wealth of information on various blogs). So if you ever wonder if your time spent writing a blog is worthwhile, I would say yes!" That's been my experience, too, as a poet who blogs. The circle has widened. I've become part of an ever-growing community of poets. I've read books by poets I've met in this circle, and I know that some of them have, in turn, supported my work. Also putting a smile on my face today is a nice mention in The Caldwells Patch "About Town" feature. If you are not familiar with patch.com, it's an online newspaper spreading like wildfire throughout the US. Many towns now have their own "patch" where residents can find up-to-the-minute news, information about local events, restaurant listings, and so on. Today's "About Town" feature is Good Books, Good Deeds. The reporter recommends my new book, gives a bit of information about me, and provides a cover image. I wonder if this means that I will now be recognized at the Foodtown. 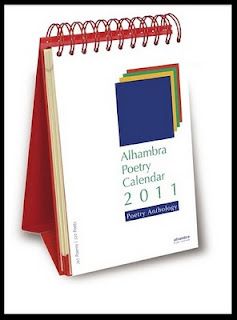 The next recommendation in the article is the Alhambra Poetry Calendar that I blogged about on Saturday. The reporter learned about the Calendar from my blog. 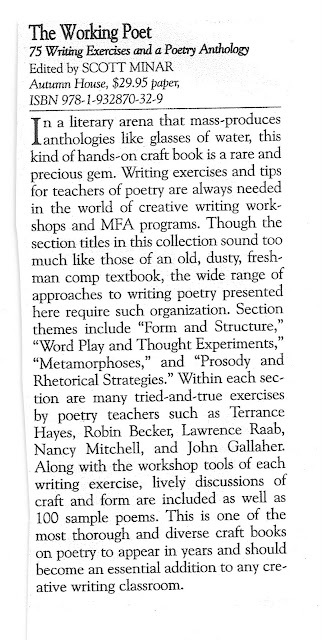 Another example of how effective blogs can be in spreading the word about poetry, poets, and books. And calendars. Speaking of restaurants, while you're visiting The Caldwells Patch, check out this review of my husband's restaurant, The Fieldhouse Pub, in Fairfield, NJ. We love this review! Also check out the virtual tour (just click on the small video image). I made this video and must say I'm rather proud of my work. I used Animoto, a wonderful program for video-making. Need an idea for a great holiday gift for someone who appreciates poetry? This calendar can sit on a desk or a table, at home or at work. It offers an ideal way to begin the day or end it. No need to check a website or inbox for your daily poem. Alhambra’s stand-up desk calendar for 2011 contains 365 classical and contemporary poems by more than 300 poets. Poetry from different eras and poetry movements is included, with a particular emphasis on contemporary poetry. The calendars are bound in a spiral, so there is no need to tear off pages and they can be used later as a reference book. The calendar comes in English, French, and Deutsch. It's priced at $29.95. That might seem expensive, but calculate how much that comes to per poem and you'll see that it's a major bargain. You can order the calendar from Alhambra or from the Academy of American Poets. When you're deciding who should receive this lovely gift, don't forget to ask for one for yourself! Nobody came up with the correct name of the form in my last post. Fortunately, while I was straightening out my extremely cluttered kitchen table, I unburied the source. The form and the directions are found in Kim Addonizio's book, Ordinary Genius, which I previously blogged about here. The prompt is found on p. 254. The form is called a "sonnenizio," invented by Kim and bearing her name, i.e., a fusion between "sonnet" and "Addonizio." 1. Begin with a line from someone else's sonnet. 2. Your poem must be 14 lines. 3. No meter or rhyme scheme. 4. One word from the first line must be repeated in each of the following 13 lines. 5. The last two lines must rhyme. Now I think it would be fun if we each invent a form that is a spin-off of a known form. Then we name it using Kim's fusion method. In my December Poetry Newsletter, which went out this morning, I recommended Strange Terrain: A Poetry Handbook for the Reluctant Reader, by Alice B. Fogel. Unfortunately, while the link had been working, I somehow messed up and the newsletter went out without an active link to Amazon. So I'm going to include my brief writeup here, along with the cover and link. 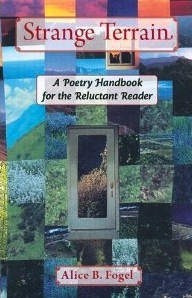 This month I'd like to recommend Alice B. Fogel's Strange Terrain: A Poetry Handbook for the Reluctant Reader. The book is designed to make poetry comprehensible and enjoyable to those who are intimidated by it. And it serves that purpose, but it also is a kind of primer, taking the reader chapter by chapter through an understanding of the elements of poetry. What to look for in a poem? What to appreciate? 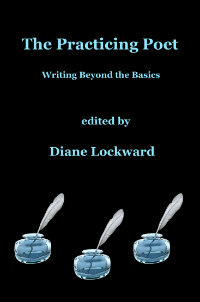 I think the book would also be useful to those hoping to enhance their own writing skills. It might also be useful to someone planning to lead a workshop as it proceeds in a developmental way with first things first, then moving on to more challenging areas. One aspect of this book that I find unique and interesting is that Fogel uses her own poems to illustrate the poetic concepts. I wasn't sure if I would like that approach, if it would seem egomaniacal. And what if I didn't like her poems? However, I found it enlightening and fascinating to observe a poet analyzing her own work, to witness this poet's mind at work. And I did like her poems.